Sunday January 20th at noon, per the Constitution, President Barack Obama was sworn in for his second term. On Monday (coincidentally, the MLK Jr. holiday), the public swearing in and parade was done. We attended the first swearing in 4 years ago along with nearly 2 million of our closest friends. We made a special trip to DC for that. Here it is 4 years later, and we have been residents of the area for over 3 years. Attending the festivities should have been a breeze. We know the area, we know the shortcuts, we had the experience of what to expect. This time should have been easy. In a combination of over-thinking it and the US Park Service blowing it, we were not as successful as last time. Four years ago, we got on the Metro at the end of the line in Vienna. We got in line before sunrise, and waited well over an hour just to get down to the platform. When we got on the train, it was packed (remember - this is the end of the line where the car starts out empty). At the next stop, only a few people could get on, and that repeated itself down the line. I felt bad for those standing shoulder-to-shoulder on the platforms watching as train after train pulled in with zero room for new people to get on. The trains moved slowly, but we got down to L'Enfant station with plenty of time to rendevous with our friends. This time, we were determined to avoid Metro. Mala had told us VRE was a breeze, and there's a station only a couple miles from us, but they weren't running on Monday since it was MLK Day. We decided to take Amtrak instead. We would take the DASH bus from our neighborhood to the King St. station, then walk the 500 feet over to the Alexandria AmTrak/VRE station and take AmTrak in. It meant we wouldn't arrive in Union Station until 11:00, but that should have given us enough time. As we waited for the train we saw several Metro trains arriving at the King St. station, nearly empty, heading into the city. 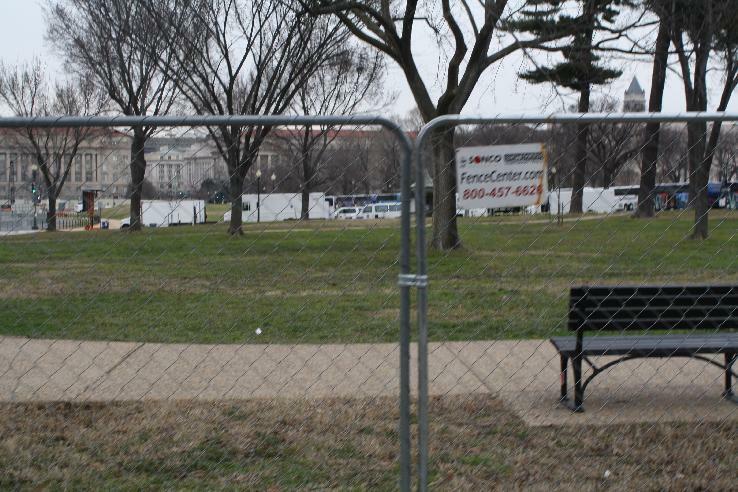 However, with all the security fencing, we had to walk around the east and south side of the Capitol building. 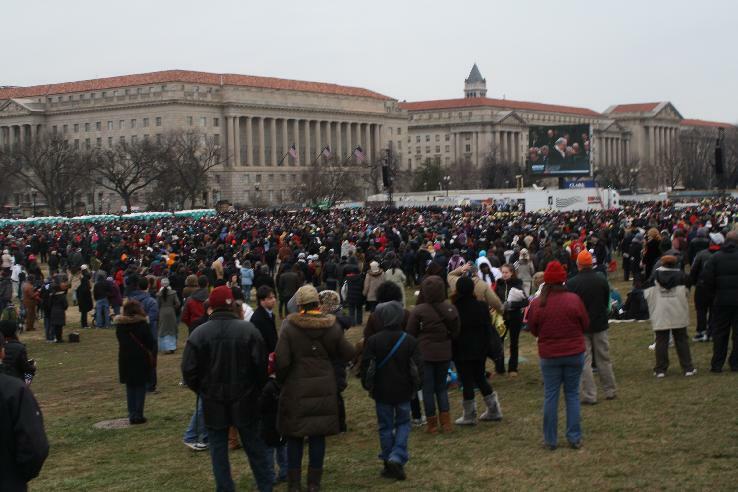 By the time we got to Independence Ave. on the south side of the Mall, the President had begun his address. We listened on our little transistor radio as we made our way west, looking for an access into the Mall. We were unsuccessful. At all of the access points, they were only letting people out, not in. Keep in mind that the only was to actually get here was either via the route we took (if one had come in via the metro stations south of the mall), or by going around the north and west side of the White House on 19th St if arriving via the northern Metros. It was very inaccessible, whereas the mall area itself could have been and should have been easily accessed. After the proceedings were done, we had hoped to get to the parade route on the south side, but - once again - the security was only letting people out. We had to go around the White House via the previously mentioned route north on 19th to K St., and then east. We ended up in a bar and watched the rest of the festivities while drinking and eating and meeting new friends. All in all, I am still glad we did it. Nothing can beat that instant connection one gets when strangers gather for a common purpose. As we walked down Independence Ave. with the radio playing the President's address, we had people walk close to us so they could hear. We even had a few people take our picture. On the other hand, the planners underestimated the turnout and overdid the security. There was no reason for that much of the Mall to be closed off. There was no reason to not allow people to traverse to the southern access of the parade route. There was no reason to route people that many blocks around the area. It surely put a damper on the moods of those who traveled here from far away, only to be met with a fence and a stern guard and nothing to shoe for it but a lot of aimless walking. Will we go into the city for the 2016 inauguration? Maybe... it depends on who wins. I suspect whoever it is, it will be less crowded. Still - I will take the lessons learned of these two attempts into account before planning out our strategy.